Do you enjoy a good cuppa tea every now and then? What about everyday? Maybe you’re an enthusiast or just a casual drinker, but if you like fixing your own cuppa tea shouldn’t you know about the most important thing: steeping times? Certainly. Well, if you’re an iPhone or iPod Touch user, you’re in luck. There’s an app for that. Several, actually. 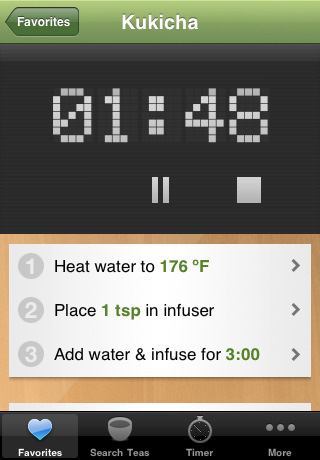 Water-Powered Ideas has a new release, Infusion, which is their take on the tea timer app. Infusion joins a (surprisingly) sizable group of tea timer apps that provide brewing instructions s to it won’t get any points for originality. It does a decent job compared to its compatriots Teavana, My Tea Timer, and Tea Forte Tea Timer. Infusion offers an simple, easy to use interface. The app comes with steeping instructions for over 100 different teas and includes a built-in timer. You can also mark your favorite teas so they will be easily accessible for future timing. The timer can also be set for those who prefer Fahrenheit or Celsius temperature measurements. Developers of Infusion should be commended for their attempt at an easy to use, quick interface. Infusion does what it promises, but not much more than that. You can customize the app to launch your favorite teas, the timer, or the search page on start-up. The timer is also easy to start and stop (just remember to leave the app open for it to work). They even allow users to add their own favorite blends and adjust for timed beverages. I also appreciate the autofill results that show up as I am typing. However, I can’t recommend this app because it feels unfinished compared to what other apps offer (i.e. Teavana). Teas are not viewable by their variety (green, black, herbal, etc. ), region, and steeping times. Having results be generated from searches alone is very limiting and does not encourage users to try different teas. Developers could also improve the app by offering recommendations based on selections users make, or offer up similar (or completely different) tasting teas. Including information on the tea itself like more details on taste, caffeine amounts, health benefits, location, growth, production, history, and culture would also be interesting. Additional features would also give this app a much needed jolt. Offering integration with social media clients would be a fantastic addition. If the app was integrated with Facebook, Twitter, MySpace, etc., users could share their favorite teas or blends. The graphics could also use some improvement. The app looks like it could use a caffeine boost because it looks pretty ho-hum right now. Everything from the animations, background, and font feel boring and plain. There’s a lack of color and variety. Minimalism should not mean lack of visual detail and appeal. Audio and sound effects could also use some improvement. Users should be able to customize their desired sound effects for the timer. Perhaps developers could even allow users to customize timers based on tea types (green, black, etc.) or steeping times. Finally, the app could distinguish itself by adding a notes section for each tea so users can record their experiences. If users were able to mark or remove their least favorite teas, that would be great too. Infusion offers a decent basic timer, but you’ll be disappointed with the app the way it is now. At $1.99, the price is too steep (pun intended) especially when there are better apps out there that will give you more for free. AppSafari review of Infusion was written by Linda Ta on May 13th, 2010 and categorized under App Store, Food, Health, Reference, Search, Utilities. Page viewed 3913 times, 2 so far today. Need help on using these apps? Please read the Help Page.